1. Login to your cPanel on your web server. 2. Scroll down to the “Domains” section. 4. Where it says “Subdomain”, enter the prefix you want before your domain name (i.e. “store”). 5. In the drop-down menu next to it, select your domain (i.e. garbleygook.com). 6. By default, cPanel will place the document root for the new subdomain under the document root for your default domain. If you want it called something else or stored somewhere else, modify that box, but be careful not to mix files unintentionally. Once you have created your subdomain, you can modify the settings any time in the “Modify a Subdomain section”, simply by clicking on the document root path of the one you want to edit. It will take you to the file manager for that subdomain. 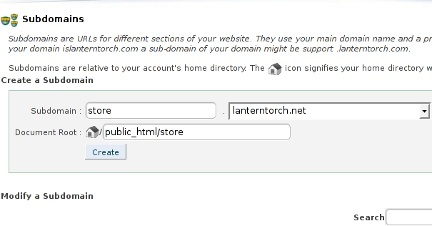 Clicking “Manage redirection” will cause the subdomain to redirect to the URL of your choice.